This is what we saw at first when we drove off the exit--a pasture of grass and trees, surrounded by a twelve foot high, barbed wire topped fence. There were warning signs on the fence, that the bison that lived within were owned and managed by Denver Mountain Parks City and County of Denver. 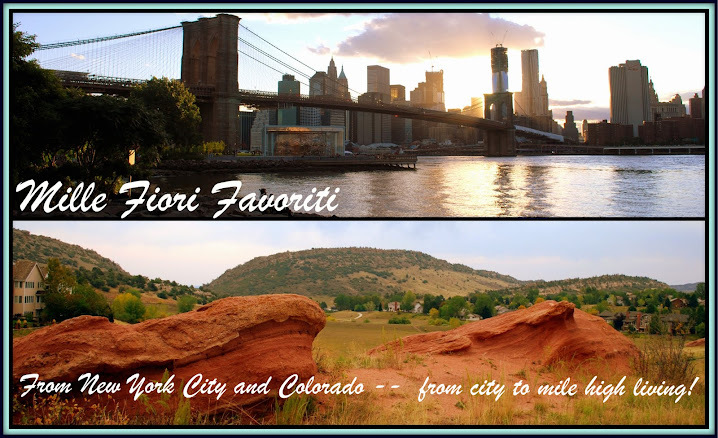 Denver has 46 mountain parks, with over 14,000 "pleasure acres" for the use of hiking, picnicking, and sightseeing in the Front Range foothills and the Rocky Mountains, all within an hour's drive of Denver. This sign on the fence has been severely weathered and it's hard to read, but it tells the sad tale of the American Bison--the true name of the animal which is often incorrectly referred to as a Buffalo. The North American Plains were once roamed by as many as 60 million wild Bison. As westward expansion occurred in the 1800s by gold prospectors, homesteaders, the US Army, and railroads, there was wanton destruction of bison. They were slaughtered for their hides, as a sport, and as a way to control the Native American population which relied upon bison as a major food source. By the late 1880s bison were nearly extinct, with less than a few hundred left. Fortunately, conservationists, such as President Teddy Roosevelt and William T. Hornaday, founded the American Bison Society to help prevent the total extinction of bison. 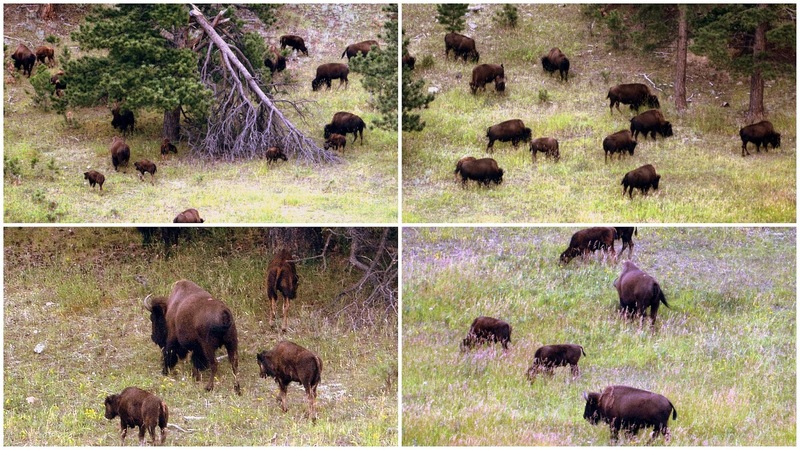 The last wild bison were contained in Yellowstone National Park. and the Denver bison are direct descendants of this herd. Two bull bison were brought to the Denver Mountain Parks system in 1914 and mated with bison cows from the Denver City Zoo. They have thrived over the years. Since we did not see the bison in the meadow on the north side of the interstate, we drove back to the south side towards Genesee Park. There is actually a tunnel that the bison can use to travel under the interstate from one side to the other. It connects the south and middle pasture to the north pastures. Genesee Park is Denver's first and largest mountain park at 2,413 acres. We began to drive up Genesee Mountain which ascends from its base at 6,000 feet to its 8,284 feet summit. As we drove, we finally saw the bison herd! Twenty new calves were born this past spring, and if you look closely you can see them, as they are lighter in color. The bison were eating machines, enjoying the wild grasses in the meadow. The Bison is North America's largest land animal. 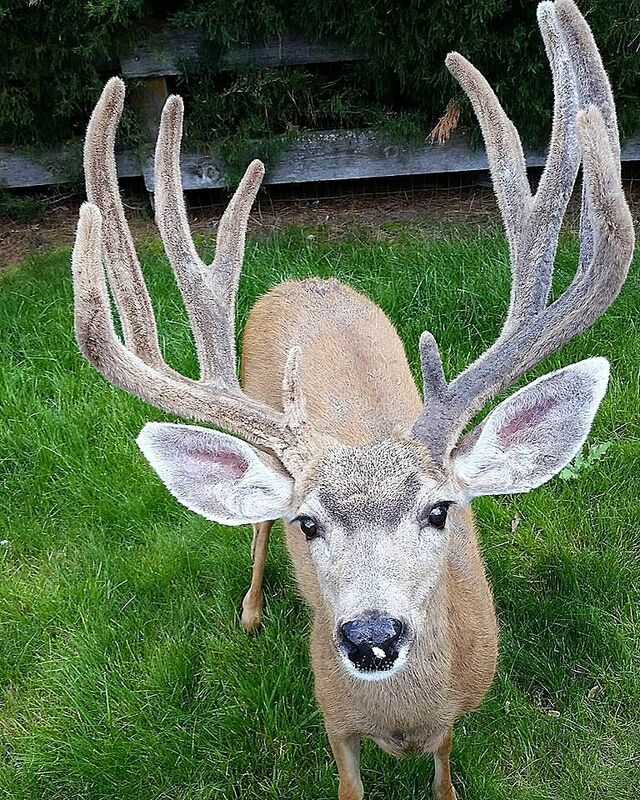 Males can stand six feet high and weigh between 1,000 to 2,000 pounds. Females stand up to five feet tall and weigh 800 to 1,00 pounds. They are herbivores, grazing on grasses and sedges. We enjoyed watching the bison for quite awhile. The bison have about 743 fenced in acres to roam, and the herd numbers are kept under control, in order that they will have enough to eat. Excess bison are auctioned off to help pay veterinary and maintenance fees. Today, wild bison number around 19,820 nationwide, according to the Denver based National Bison Association. An estimated 250,000 head are raised on ranches for hides and meat, although many bison have been interbred with cattle, or carry cattle traits. The largest herd of free roaming bison today are in Yellowstone National Park, with approximately 3,500 bison. After watching the bison herd we then took a drive up towards the summit of Mt. Genesee. The day was overcast and threatening rain, but we could still see some of the distant mountain ranges. When we arrived at the parking area near the summit we saw this couple enjoying the peaceful view and cool mountain air. 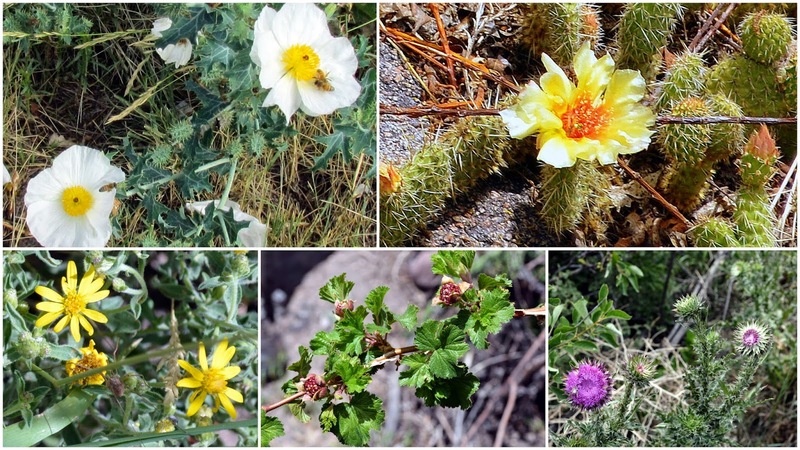 This photo collage of some of the berries, flowers, and grasses we saw along Mt. Genesse's summit trail. 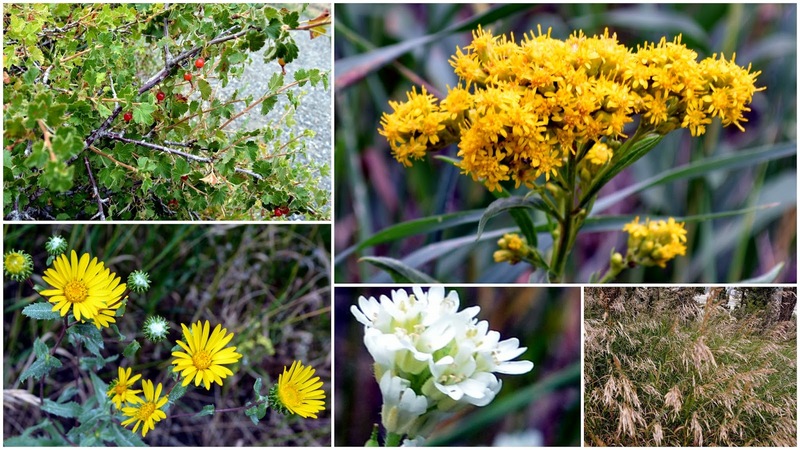 Photo upper left: Baneberry, photo upper right: Smooth Goldenrod, photo lower left: Gray Golden Aster, photo middle bottom: Hoary Alyssum. Last photo bottom right is of wild grasses. The word Genesee is a Native American word for "shining valley" and seeing bison roam relatively free in this park was a shining moment for me! I'll be looking for them again on future trips to Genesee Park. Come back next blog post where I'll show you our exciting drive up to 14,000 feet on Mt. Evans. It's the highest paved road in North America! We then headed even further east, away from this majestic view of Pike's Peak. 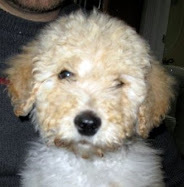 We pulled into a parking lot where we waited until we were met by an SUV, that led us to a secret location. Our destination? 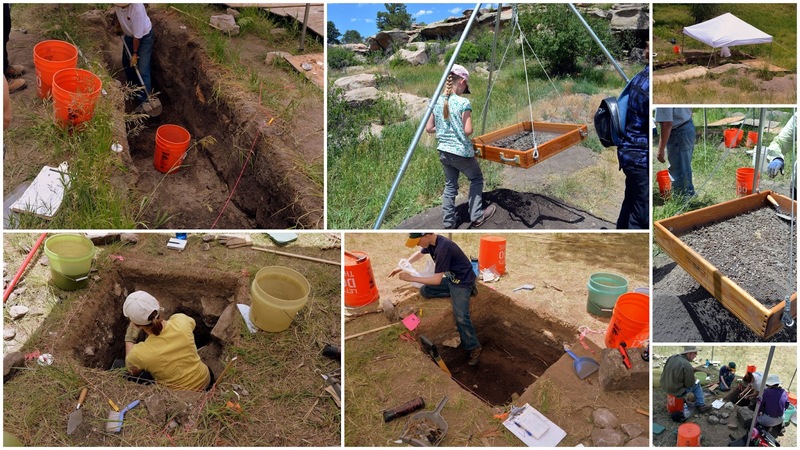 It was an archaeological dig being conducted by the Colorado Archaeological Society (CAS). We were invited to see the dig site by the historical society in our community, of which we are members. The CAS has an interest in the history and pre-history of humans in Colorado and were conducting this dig in a site that they knew had a deep history of being used by prehistoric people, Native Americans and early Spanish and American explorers to this land. The reason the site was basically being kept a secret is that they plan on returning it to its natural state when they are finished with their exploration. ...and secondly, because there was a rock cave shelter nearby. If you look closely at the photo above you can see how one of the last tenants of a farmhouse on this land closed up a portion of the rock cave entrance with bricks and a wooden slat door in the middle. He probably used the cave as a storage space for food and other supplies. A view inside the cave. 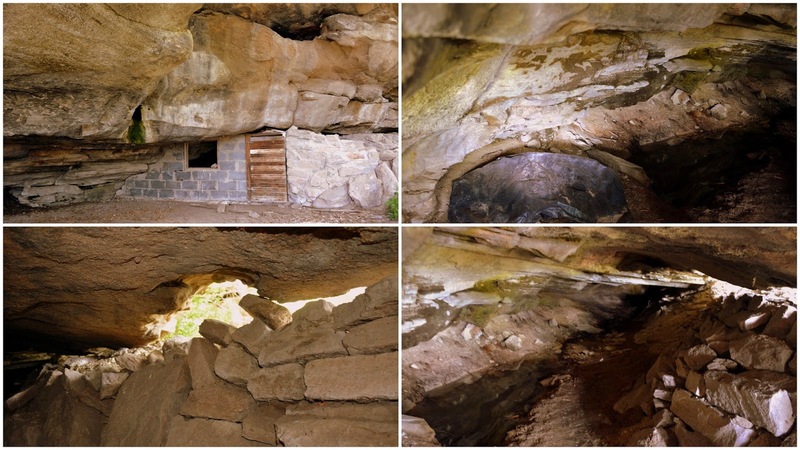 Native Americans also used caves such as this as shelter, as well as past explorers to this land. Artifacts from these past peoples were in the process of being found by the archaeological team. Knowing that there would have been camp areas around the cave, they dug deep trenches in various positions in front of it. All the dirt that was removed from the trenches was carefully sorted through screens, such as this one, and anything significant is removed for examination. ...as well as spearheads, arrowheads, ancient awls, bones, and pieces of cooking tools and other hunting weapons. It takes a trained eye to identify the artifacts as being important! The CAS has been conducting the dig for months and uses radiocarbon assays to date the artifacts. One of the earliest artifacts found was a spearhead that dated from 8,000 years ago! My husband and I found it so fascinating to watch the work being done and see some of the discoveries of the day. We hope to become members of the CAS one day to learn more about Colorado's rich prehistoric and historic past and to volunteer for future digs. Before we left the dig site I took some photos of the wildflowers in the area. If you look closely at the photo bottom left, you can see that there was a creepy crawly bug on one! I did not see that until I enlarged the photograph--I'm not sure what it is but it has a thick brown body and very long legs! I'm glad it did not jump up on me at the time, or my camera would have also become history! 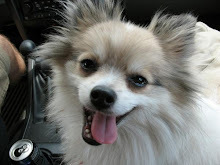 (smile) Does anyone have any idea of what it is? 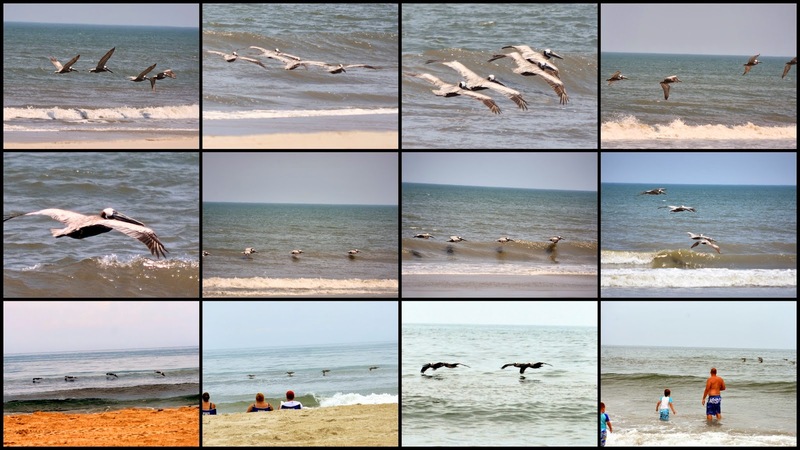 Outer Banks Wild Horses, Historic Lighthouses, Dolphins and the Wright Brothers..oh my! 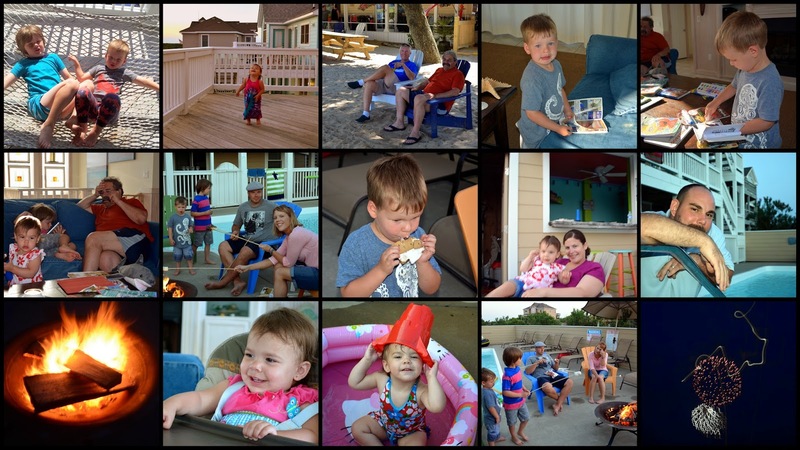 My family enjoyed a vacation in the town of Corolla, in the Outer Banks, of North Carolina in July--to see more about the house we rented, and the special occasion we celebrated during that week, click here. We also participated in many fun and interesting activities that week and visited some wonderful historic sights. I could make a blog post about each one, but I combined them here in a condensed version in order to return to blogging about Colorado very soon. I hope you'll enjoy this vacation look back--photo-rich, I promise! One of the activities we enjoyed with our grandchildren was a wild horse tour in a large Hummer 4WD Vehicle! There are many wild horse tours to chose from, and unless you are driving a 4WD vehicle while staying on the Outer Banks (also known as the OBX), it is the only way to enter the most northern part of Corolla, on Carova Beach, which is designated as a "4WD Vehicle Only" accessible beach. 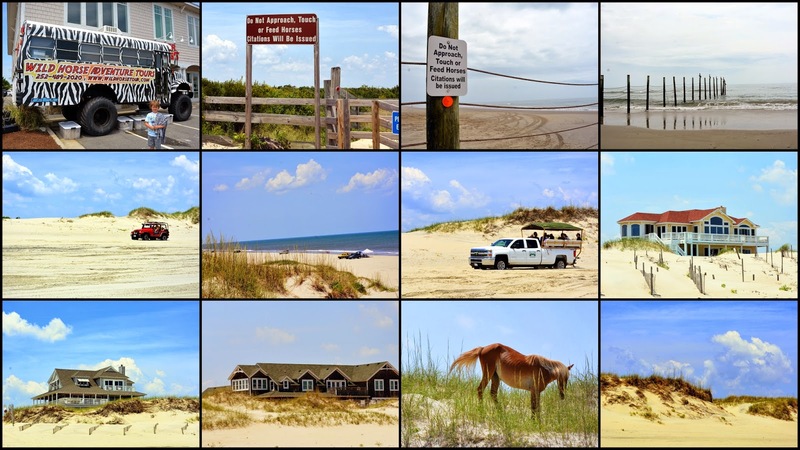 As you can see by the first photos going across the upper portion of the photo collage above, this portion of the Outer Banks is separated by protective fencing, that keeps the wild horses on this part of the island in a natural 7,500-acre sanctuary. This part of the OBX is more secluded, and less populated, has less traffic, and has no stores or restaurants. The horses are descendants of the mustang wild horses that were brought to the islands by Spanish and possibly, English, explorers around 500 years ago. When you glance at them for the first time, their beauty and grace will take your breath away! It is advised that viewers of the wild horses remain 50 feet distance and do not feed them under the penalty of a fine. The Corolla Wild Horse Fund has been set up with the mission to protect, conserve and manage the horses that roam freely on this part of the island. Quite a few had local birds riding on their bacs! The horses find water in freshwater ponds inland, and this is an excellent place to find them in small herds. They eat native grasses and flowers. The weather is temperate here all year round, so they usually have no problem finding enough native food to eat. The horses are significantly smaller than modern varieties, with an average height of about 14 feet tall. They are all shades of brown, from honey to almost black chocolate, with thick manes. If you ever visit the Outer Banks a visit to see the wild horses is definitely something you should do! I love visiting lighthouses, and the Outer Banks barrier islands have five of them! I was fortunate enough to see three of the five. The first lighthouse was located only a mile and a half away from the house we rented, and my husband and I took a walk over to see it one morning. The Currituck Beach Lighthouse was built in 1875 and is located between the Cape Henry Lighthouse and the Bodie Island Lighthouse. It was the last brick lighthouse built in the Outer Banks, and the only one left unpainted. The Currituck Beach Lighthouse is known as a first-order lighthouse, as it has the largest of seven Fresnel lens sizes. With a 20-second flash cycle, the light can be seen for 18 nautical miles. The distinctive sequence enables the lighthouse not only to warn mariners but also help identify their locations. There are 214 steps inside to the top galley platform, and if you look closely at my photo you can see the line of people waiting to walk to the top! We did not do the climb, as we wanted to walk around the nearby Historic Corolla Village and see the sights there. Also called a Light Station, Bodie Island Lighthouse is the third lighthouse to be constructed at this location, as the first was abandoned due to a poor structure and the second was destroyed by the retreating Confederate Army during the Civil War. Constructed in 1872, it had a first-order Fresnel lens and was manned until 1940 when it was completely automated. It is located on Roanoke Sound, north of Oregon Inlet, south of Nags Head, at 156 feet, it is one of only a dozen surviving brick tower type lighthouses in the US. It was also open to climbing--214 steps to the top! 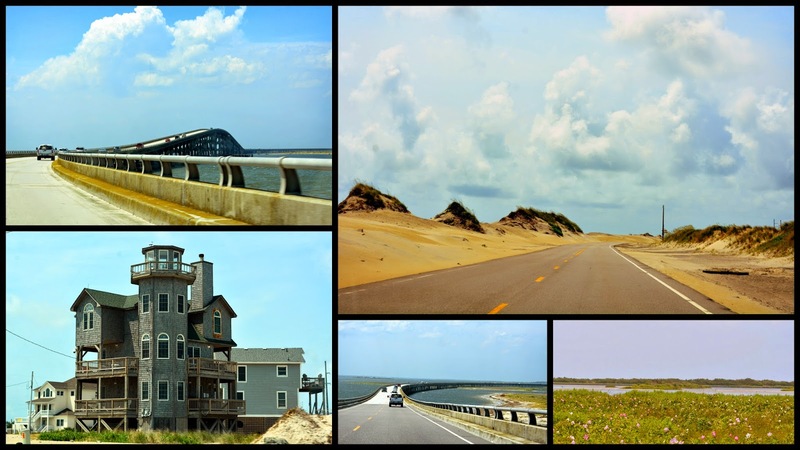 As my husband and I drove over 84 miles south towards Cape Hatteras (almost two hours driving time) we passed through the beautiful areas of Pea Island National Wildlife Refuge, and the Cape Hatteras National Seashore. 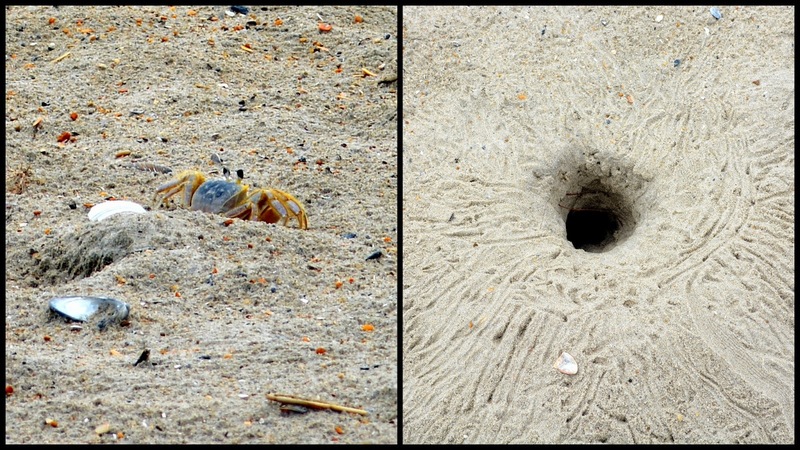 Both are areas I would love to explore further if we return to the Outer Banks in the future! The ride was very scenic and I enjoyed snapping photos as we drove along. 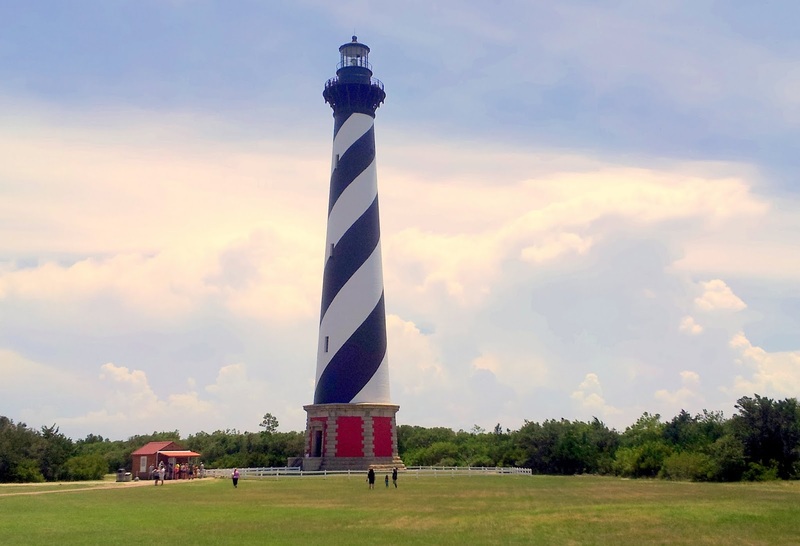 I was especially excited to see the Cape Hatteras Lighthouse, as I remembered reading about how it was moved inland in 1999, in order to save it from beach erosion. When it was built it stood 1,500 feet from the ocean. By 1999, the lighthouse was within only 100 feet of the ocean! To protect it, it was moved inland 2,900 feet, over a 23 day period. You can read more about that engineering feat at this NPS link, and see an interesting YouTube video about the move at this link. The Cape Hatteras Lighthouse protects one of the most hazardous sections of the Atlantic Coast. Offshore of Cape Hatteras, the Gulf Stream collides with the Virginia Drift, a branch of the Labrador Current from Canada. This current forces southbound ships into a dangerous twelve-mile long sandbar called the Diamond Shoals. Hundreds, and possibly thousands, of shipwrecks in this area have made it known as the "Graveyard of the Atlantic." Constructed in 1870, the Cape Hatteras lighthouse was also the third lighthouse constructed in this sight, with the first two found to be insufficient and destroyed. At 210 feet high, it is the highest all brick lighthouse in America! Inside is a spiral staircase of 248 steps, and a climb would equal going up to a 12 story building. The public is able to buy tickets to climb to the top, but we did not do that as we had to return back to Corolla in a timely manner to get ready for my son and daughter-in-law's tenth wedding anniversary vow re-newel ceremony that was taking place that afternoon. 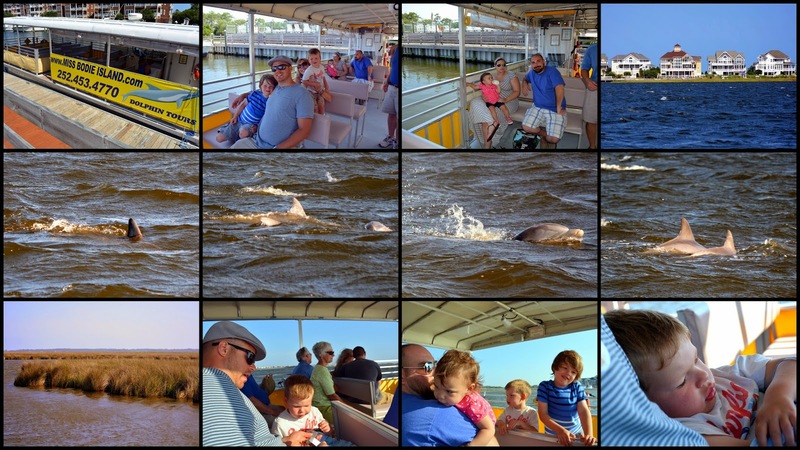 Another favorite outing we had with the entire family was a boat ride--the Bodie Island Dolphin Tour! We passed many magnificent homes along the wetland shores of Pirates Cove in this area until we were well out into the Roanoke Sound. It was fun to watch the bottleneck dolphins swim and frolic in the water. We also saw nesting ospreys. herons, egrets and brown pelicans along our ride. The boat ride was so relaxing our younger grandson fell asleep on the way back to the dock. Afterward, we went to an "all you can eat" seafood restaurant in the area and indulged on wonderfully fresh seafood. It was the perfect day! 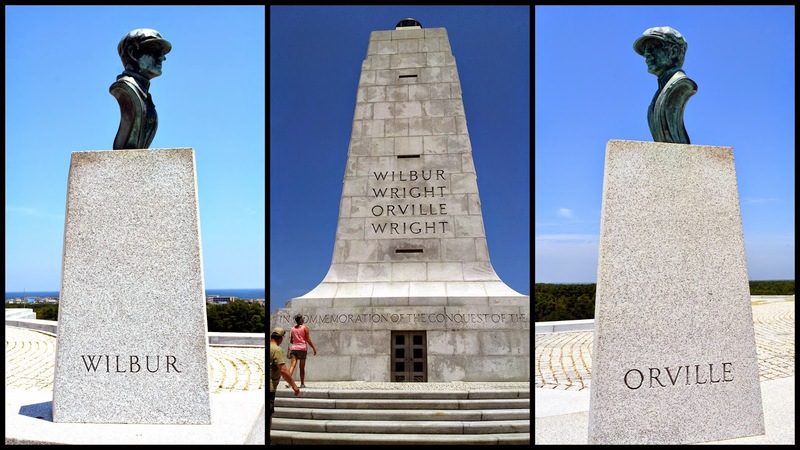 I would have been remiss to not have visited the Wright Brothers National Memorial on my visit to the Outer Banks. Located in Kill Devil Hills, this area marks the spot where Wilbur and Orville Wright, after four years of experimentation and dreaming, achieved their first successful flights in 1903! 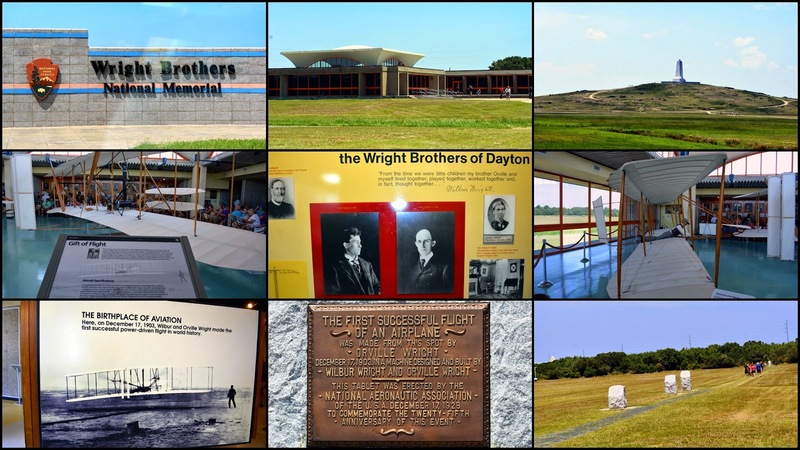 The site has an interesting visitors center where the story of the Wright brothers and their dream of flight is explained, and models of their first glider and the first powered aircraft in history to maintain a sustained flight, are located. The original airplanes are located in the National Air and Space Museum in Washington, DC. We listened to an informative Ranger talk about the Wright brothers and enjoyed all the exhibits inside the visitor center. Outside, on the hill the brothers used to help the winds help them take flight, is a 64-foot granite monument dedicated to them in 1932. Atop the monument is a marine beacon, similar to one found in a lighthouse. Also, along the grounds are granite markers that show the date and distance of each of their successful flights. The collage above shows the distance from Kill Devil Hill to the first successful flight marker. There are four markers in the field that show the distance of all four flights the Wright brothers made on Dec 17, 1903. The last of which is the historic fourth flight, of 852 feet of flight in 59 seconds, with Wilbur as the pilot. It proved that the aircraft could be controlled and sustained in a "heavier than air" machine, which opened the door to future aeronautic discoveries! 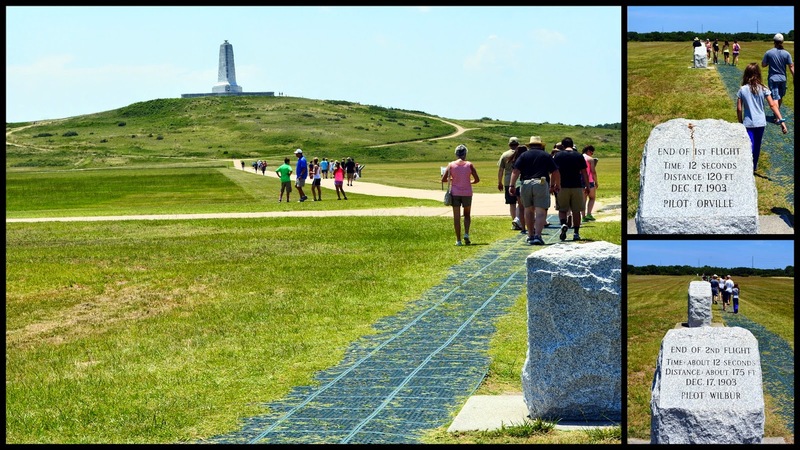 This is the monument on top of Kill Devil Hill with tributes to both Wilbur and Orville Wright located on either side of it. This is the view looking down from the hill towards the flight markers, the airplane hanger and house the Wright brothers stayed in when they experimented with their flights on December 17, 1903, and the Memorial's Visitor's Center. There is also a nice view of the Kill Devil Hills community and the Atlantic Ocean from atop the hill. Most people associate the Wright brothers with the town of Kitty Hawk, as that is the town where news of their successful flight was sent out to the world. The Wilbur and Orville Wright--"They Taught Us To Fly" memorial plaque located on the National Memorial grounds. I love to fly, and it was thrilling to pay homage to the men that began it all in the last century! 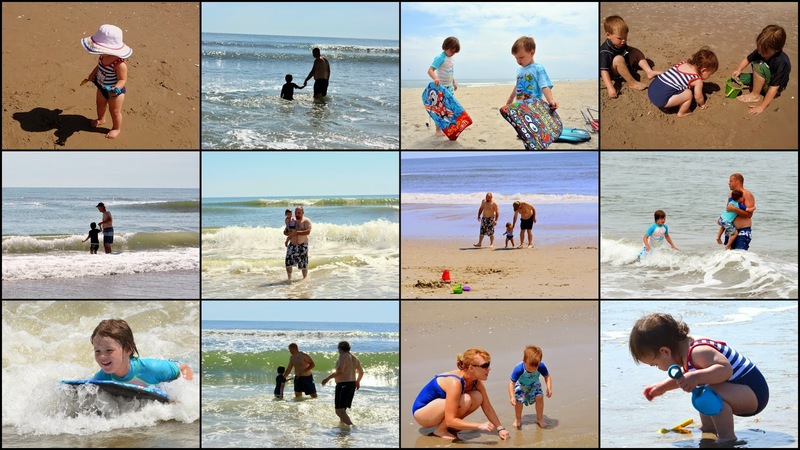 A last look at more of the happy memories we now have of the Outer Banks of North Carolina. I hope you also enjoyed your armchair visit to many of the attractions of this beautiful area of the United States. Someone asked me if I missed living near the seashore, and I have to admit I miss the availability of all the fresh seafood one can find in New York City and all along the east coast, but I am now in love with the Rocky Mountains and all the beauty I've seen in Colorado. I have much to show in future blog posts about what we have been doing this summer in our wonderful new state! It is hard to believe that we are already well into the month of August! Children will be going back to school here in Colorado in the next week or so, and I have already felt a few cool breezes that remind me autumn will soon be here. 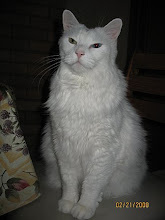 We are having a very enjoyable second summer living in Colorado, and my husband and I have been doing quite a bit of things here that I will be showing soon, but first I will be taking you to the Outer Banks region of North Carolina, where we had a wonderful family vacation, and special occasion, in July. I took many photos there, and to save space and your time I have placed many into photos collages for this post--please click on the collages to enlarge them for easier viewing. 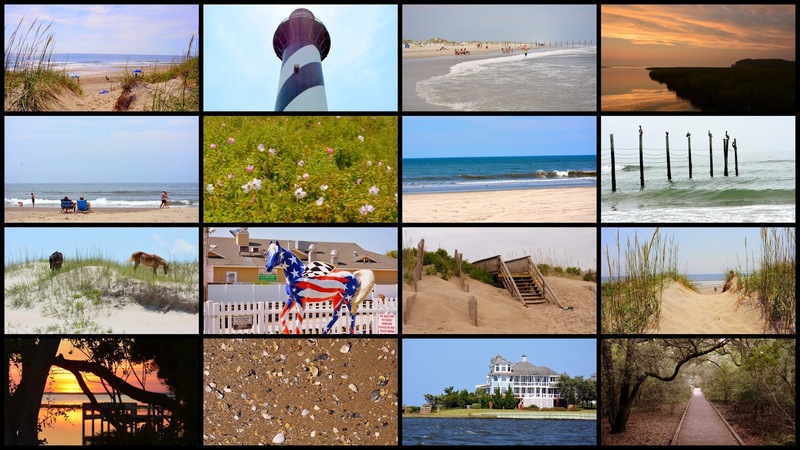 The Outer Banks (also known as OBX) is a 200 mile (320 km) long string of narrow barrier islands off the coast of North Carolina and a small portion of Virginia, beginning in the southeastern corner of Virginia Beach on the east coast of the United States. They cover most of the North Carolina coastline, separating the Currituck Sound, Albemarle Sound, and Pamlico Sound from the Atlantic Ocean. They are a major tourist destination and known for its temperate climate and wide, an expanse of open beachfront. We flew to the east coast and stayed a couple of days in our nation's capital, Washington, DC--click here to see that post-- and then drove south through Virginia to North Carolina. After crossing the Wright Memorial Bridge, we head back north toward the town of Corolla located in the north portion of the Outer Banks. At first glance, we could see the charm of this area. ....and the Atlantic Ocean side. These homes are usually rented in one-week increments and can range from a three bedroom cottage to a house with 18 bedrooms! A number of reputable vacation rental management companies serving the area, so there is generally a wide selection of homes to choose from. We were vacationing with my son and his family, his mother-in-law and father-in-law, and our daughter and her family. so we needed a larger house to accommodate us all. 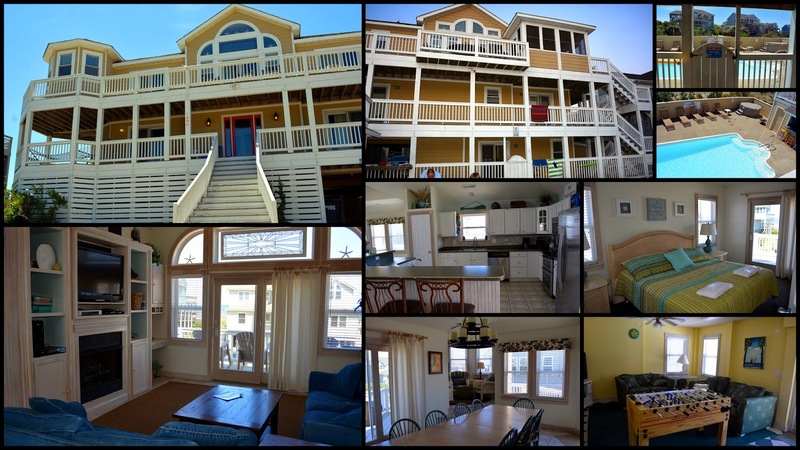 My daughter-n-law and her sister and parents often vacationed in the Outer Banks when they lived in Virginia, so we knew they would be able to find a rental that would be perfect for all of us, as it was! Our house had wonderful wrap around decks, a large kitchen with a long dining table that could fit many, comfortable king and queen size bedrooms, bunk beds for the children, a large family room, game room, outside pool, and hot tub and bar area. We were a short boardwalk away from the beach, and we hit the beach running with excitement to see the ocean again! We had all pre-rented chairs and umbrellas so we were all set for our days in the sun and surf. It was fun to see our grandsons get re-acquainted with the ocean. Even our granddaughter's first look at the ocean was a success! We enjoyed many happy beach days! Hurricane Arthur had passed by the Outer Banks the week before we arrived, but we did not see any signs of damage in Corolla. I was hoping that the storm would have stirred up the ocean bottom and bring many shells and sea glass to shore, but where I did see shells they were mostly broken pieces and not a piece of glass to be found. ...and watching the graceful flights of many flocks of brown pelicans skim the shoreline in search for fish. Speaking of fish, we enjoyed many wonderful seashore dinners in many of Corolla's and nearby Duck's restaurants. One evening we prepared a clam bake at home. 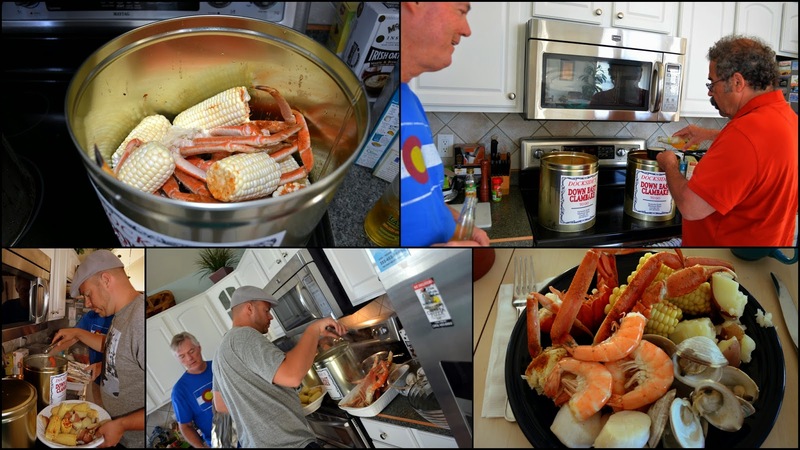 My mouth is watering again as I look at all the delicious fresh shrimp, scallops, lobster, clams, crab, corn and potatoes we enjoyed that evening! It was fun to share time together and relax. When not on the beach, we shopped at some of the pretty in town boutique stores, swam in our house's pool, sat in the hot tub, made smores and roasted marshmallows, sat by an outdoor fire, barbecued, watched DVD's inside, did arts and crafts with the children, and even saw a firework's show that was delayed a week by the hurricane. All in all, it was a wonderful extended family vacation! 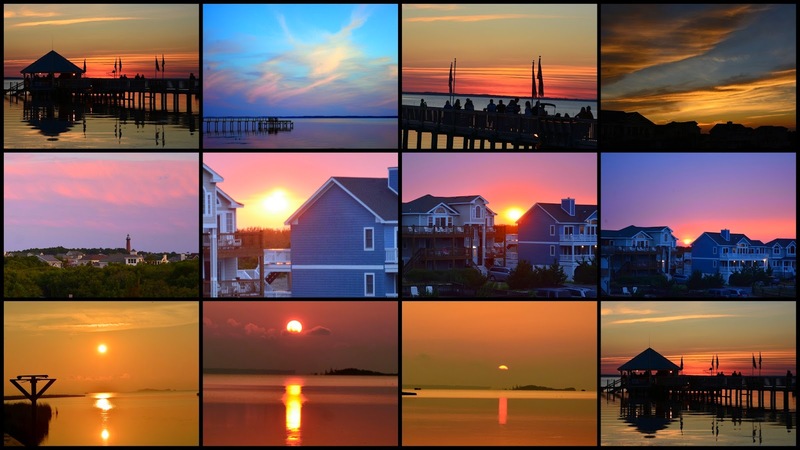 I was also enthralled by all the magnificent sunsets we were fortunate to see over Currituck Sound, both from our deck and from a nearby nature preserve. 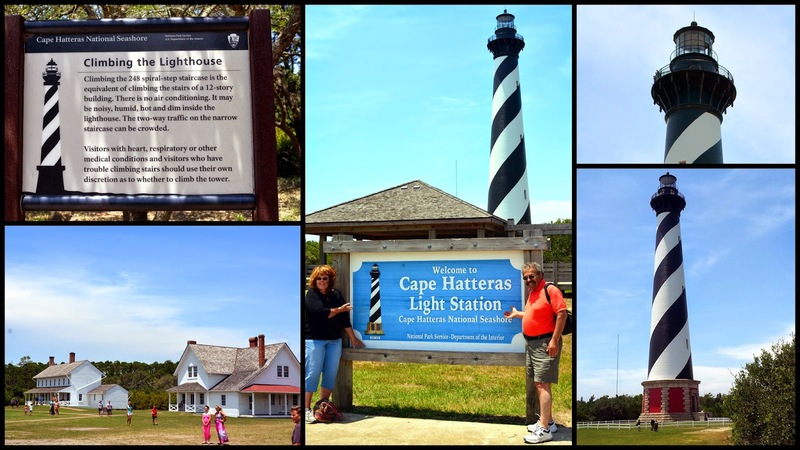 We also took many trips and outings to see lighthouses, wild horses, dolphins, the place the Wright brothers took first flight with an airplane and the Cape Hatteras National Seashore. I will show highlights of all on my next blog post. 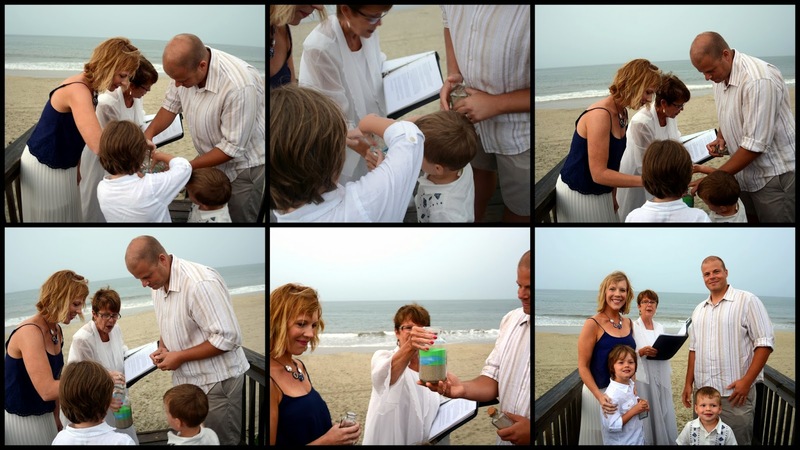 But I'll end this post with the most special family occasion and the reason we all vacationed in the Outer Banks as an extended family was to celebrate my son and daughter-in-law's 10th wedding anniversary and the renewal of their vows! As luck would have it, it was the only day we had intermittent thunderstorms! The minister kept looking up at the stormy sky, but performed a beautiful vow renewal ceremony, amid occasional thunder and lightning. My son and daughter-in-law and grandsons were all in good humor and enjoying the moment! My son and daughter-in-law wrote their vows again and recited them to each other, and my son placed a beautiful antique ring on my daughter-in-law's finger. It was such a special ceremony and it made us all so happy that we were able to share it together with them! The skies opened up at this point and we rushed back to the shelter of our rental house. We were all full of laughter and joy! 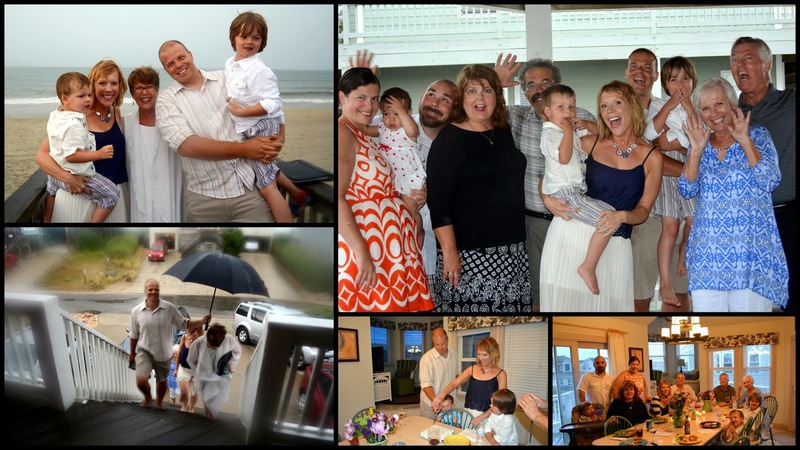 We had pizza and cake and enjoyed many reminiscences as we ended this most memorable day as a family on our Outer Banks vacation. 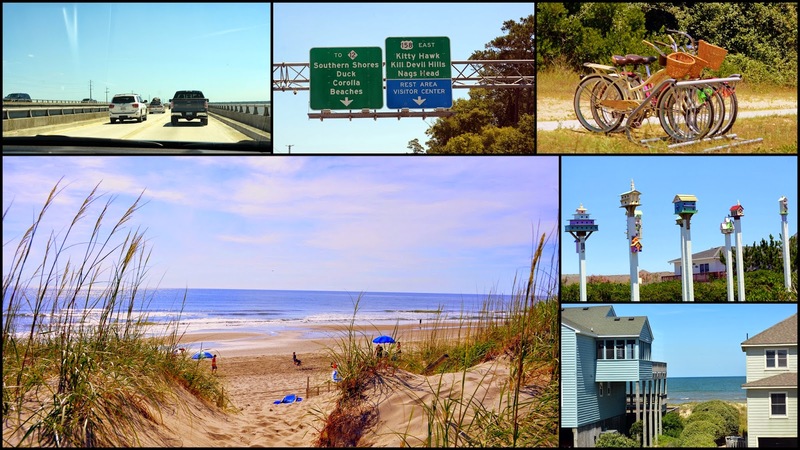 Please come back soon to see my next post to see all the other sights we saw in the Outer Banks, both scenic and historic, and why this beautiful area attracts thousands of visitors every year!